Evansville's Jaylon Brown slams down two of his ten points. Photo courtesy of Bob Pristash and @UEAthletics_MBB via twitter. On a night in which Egidijus Mockevicius surpassed Evansville legend Jerry Sloan in rebounds, the Purple Aces moved to 4-1 in conference play. NORMAL, ILLINOIS---"And they (Illinois State) beat us three times last year and they really beat us pretty good up there at their place. We got some work to do." A senior-laden team, the Evansville Purple Aces knew the importance of Friday night's showdown at Illinois State. Not only, would the game be televised on national television in the form of ESPN2, but an opportunity existed to make a statement to the rest of "The Valley." Despite not surpassing 70 points for the 40 minutes, 25 points by superstar D.J. Balentine and another double-double, 13 points and 20 rebounds, from Egidijus Mockevicius pushed Evansville past the Illinois State Redbirds by the score of 66-55. Going back and forth early, the Purple Aces controlled the first two possession lead of the contest due to Balentine "balling" with 11 points in the first seven minutes and two seconds (15-11 UE). Nevertheless, the game temporarily changed when the "star senior" picked up his second foul with 11:20 left in the first half. The score was still 15-11 visitors, but as Balentine headed to the bench, Illinois State began a 7-0 spurt, that only consumed 53 seconds, to own a three-point edge. Soon, the leading scorer in the Missouri Valley Conference found himself back in the game because Evansville was not the same team without him. Yet, and surprisingly, the Redbirds were not deterred by their biggest threat's re-entering. Moreover, they continued to stay one step ahead of the Purple Aces. Or, that was until Balentine re-found his rhythm with a layup that spurred a 13-6 half ending run, which allowed Evansville to command a 35-29 advantage into the intermission. Fans seeing a repeat of the first half in relation to the trading of baskets and the Purple Aces landing the first unmatched punch, Marty Simmons' squad raced away to the first double-figures lead with three straight baskets in the second half. However, jumping back into the game with a 7-2 soar, capped off by a DeVaughn Akoon-Purcell ally-oop slam dunk, the Redbirds seemed to seize momentum from their opponent. Unfortunately for the home faithful, that was not the case as Evansville prevented Illinois State to get any closer than four while actually re-upping their advantage to nine shortly after and 13 with 1:54 remaining in regulation. Although D.J. Balentine's team made only six of their eight attempts in the last 100 seconds, Dan Muller's group, just like against Indiana State, forgot how to put "the biscuit in the basket" by only netting two of their last ten shots. The Evansville Purple Aces had handed an L to another opponent. 0-3 since D.J. 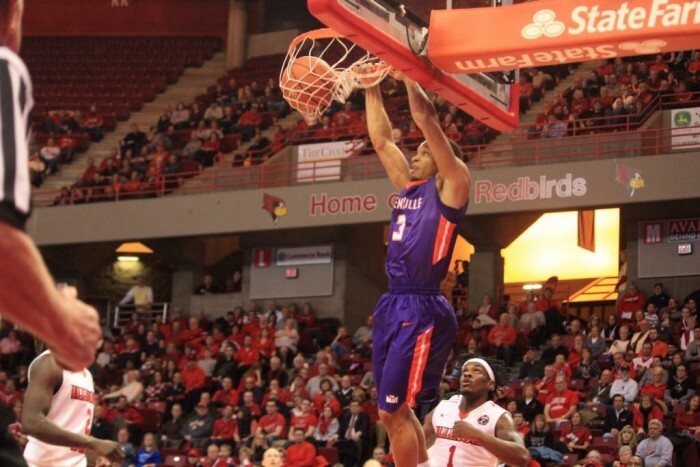 Balentine graduated high school, the seniors on the Evansville Purple Aces were determined to win their first and last game in Redbird Arena. Furthermore, and as alluded to by coach Simmons earlier, UE lost all three contests to Illinois State, including a quarterfinal at "Arch Madness," last season and wanted to avenge their past defeats in a big way. This journalist would say a double-digit win can be considered a big way! Four players on the evening posted ten or more points, including an important ten by Jaylon Brown and eleven from Adam Wing. The 16-3 (4-1) Evansville Purple Aces will look to continue their dominance in the MVC Tuesday night against the always pesky Loyola (IL) Ramblers. Beginning conference play 3-0, the Illinois State Redbirds looked like a possible threat to the Wichita State Shockers' reign over the Missouri Valley Conference. Three games later, and they look like a team not even guaranteed to be in the top half when tournament time rolls around! Really, the whole story of the team revolves around "star senior" DeVaughn Akoon-Purcell. Averaging the fifth highest point total in the conference, "DAP" is bucketing 18.7 points per game in conference victories and 11.3 per contest in conference losses. More specifically, the Orlando, Florida, native has been held under 14 points in every conference defeat thus far. The 9-10 (3-3) Illinois State Redbirds will try to end their three-game skid when traveling to rival Bradley Wednesday night.